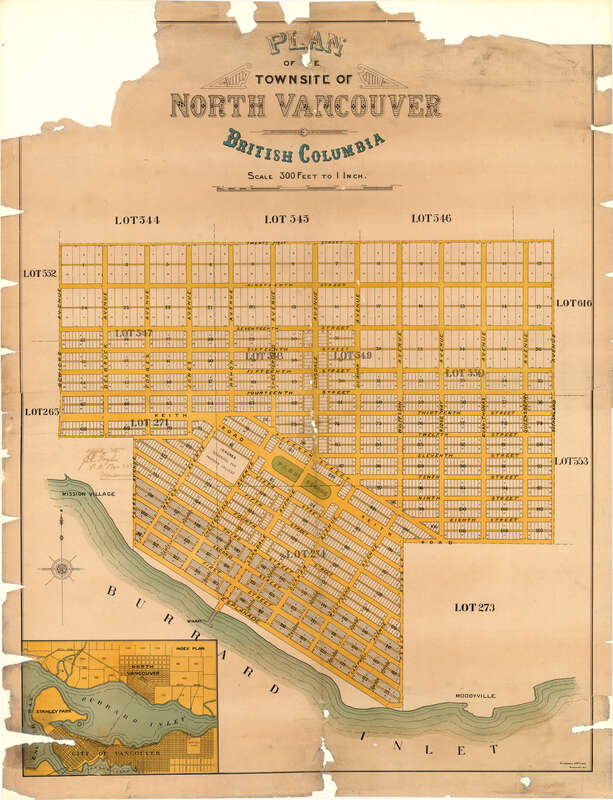 This map found in the Vancouver Archives depicts a very early layout of North Vancouver.The map is undated and is titled “Plan of the Townsite of North Vancouver” and the original link is found here. The fact it is called a “Plan” makes it more difficult to date its origin. Peter Larson’s Hotel North Vancouver stood at the Northeast corner of Chesterfield and Esplanade from 1902 until it burned down in 1929. Perhaps this map was merely that, a plan for the future of North Vancouver around that time. This may also explain why a few of the street names that appear are unfamiliar to current North Vancouverites. The street that is currently St. Georges Avenue, one block East of Lonsdale Avenue is named Durham Avenue in this map. This could be a nod to Lord Durham who was Governor-General of Canada in 1838 and 1839. Although he died in 1840, long before North Vancouver was even incorporated in 1891, there was a Lord Durham Block built on Granville Street in Vancouver in 1888. Maybe North Vancouver was also planning on honouring the long-deceased Govenor-General. The next major street on the map East of Durham is labelled Wulffsohn Avenue, now known as St. Andrews Avenue. The name Wulffsohn likely refers to a financial broker based in Vancouver who went by the spelling Wulfsohn. There was a Wulfsohn Bewicke (another current street name that appears on this map) & Co. which was located on Cordova Street in Vancouver. This brokerage actually assisted in running the Moodyville Mill for Arthur Heywood Lonsdale in the 1890’s. A small street on the map running North-South from Third Street to Esplanade between Durham and Wulffsohn is seen as Treherne Avenue. Currently this would be approximately just east of the Northshore Neighbourhood House and the tennis courts on Second Street. The only Treherne associated with the area at the time is Reginald Charles Treherne who was one of the heads of the Entomological Society of British Columbia. He was author of such works as The History of the Codling Moth and The Cabbage Root Maggot and Its Control in Canada. I’m not sure if these accolades warranted a potential street being named after him however. Just East of Wulffsohn at Third Street is a Gadsden Avenue, which would have gone directly down the middle of current day Emerald Park beside the Hamersley House (built in 1904). I am fairly certain there has never been a road of any kind in this spot, lending further credence to the idea that this map was only a non-executed plan. In the end, I feel it’s safe to say that with the names identified this map was created sometime between 1891 (after incorporation) and 1901 (prior to Larson’s Hotel, Hamersley House and the railways). It is also safe to say that it was simply a vision of the future layout of North Vancouver with changes to names and actual layout of streets being made along the way.